The Double Wall Paper Cup 16 oz offers just a little more room – and sometimes that’s all you need. Perfect for those mornings when you need just a little bit more coffee or those winter days when a few extra drops of hot chocolate are there to keep you cozy. Use these printed paper cups for your hot takeaway drinks whenever you could use some more sips. And why not advertise a brand while doing it? These printed promotional cups effortlessly market your brand. Plus, the air between the layers of card integrated into the product’s design eliminates the need for sleeves. Turns out, these cups make not only branding sense, but financial sense too. It’s no wonder that these types of custom print cups are becoming increasingly popular in the market. We use a super strong 310 gm box board on the inside wall and a similarly strong 300 gm box board on the outside wall. 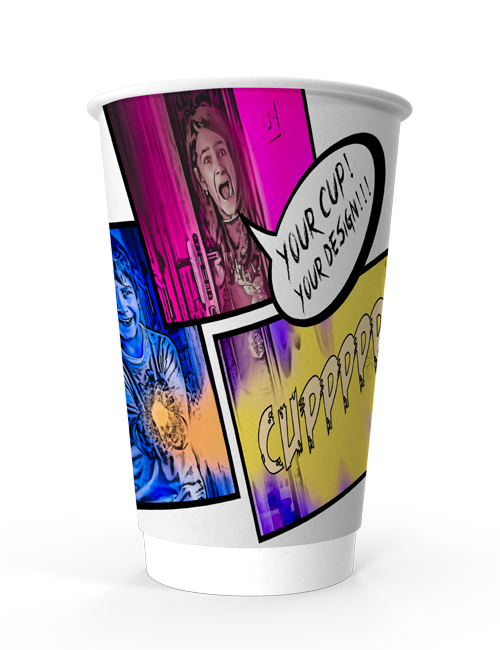 When designing your customised double walled paper cups, you can choose from either gloss or matt finishes along with all kinds of cutouts, colours, and effects. By relying on consistently sharp quality, our max resolution printing showcases your branding – differentiating it and leveraging it as a leader in the market. Orders range from 1,000 units up to 250,000 units. Regardless of the quantity, your order will be processed without any delay and your personalised printed paper cups will be delivered to you within 14 working days. For your individual Double Wall Cup 16 oz design we provide you here our rectangular template as PDF for download.